But here's something you may not be aware of: the world takes notice of the best sportsmen the UK have to offer outside of the summer months, too. You can think the rise in interest beyond European borders in the English Premier League (and the rise in licensing fees for overseas broadcasting rights) for that. And when it comes to players and clubs, there is a sort of symbiosis with contractors and management we've noticed with time. Like it or not, athletes in a team game are categorised as a resource, i.e. a contractor, by club personnel, i.e. management. This may sound familiar, and it has come about by all kinds of factors: transfer windows, agents, year-round media coverage, betting on player movement, the right to determine the path of your career, not to mention managerial signings predicated on player payroll promises (and sometimes, overpromises). So long as a smaller club like Leicester City realises that a contractor like Jamie Vardy looks good in some form of red, there will be a restructuring plan in place. That plan won't think of replacing Vardy's production, though: rather, it's trying to work out a starting 11 that replaces the aggregate of all production Rainieri and Co. have lost or replaced in the offseason. It’s like a free kick with Gareth Bale's left foot and no wall in front of you. If management is looking for the right pieces amongst freelancers, doesn’t it seem more reasonable than ever to try contracting and umbrella workers? Yes, it is impersonal. Players, clubs and fans figured that out years ago, came to grips with it, and re-channelled their energies to a football that's more world class, year-round and richer in the brilliance of UK multiculturalism than ever before. With such change, it’s reasonable to expect that some fans and pundits have decried the lost sense of loyalty, mainly to a club. Understandable. Yet despite medical and training developments meant to prolong them, sport careers have long had a more finite ending in the days of yore, and the offseason job was recognised as something of a necessity. Management held the upper-hand, not unlike other labour/management struggles. Not necessarily the good old days. 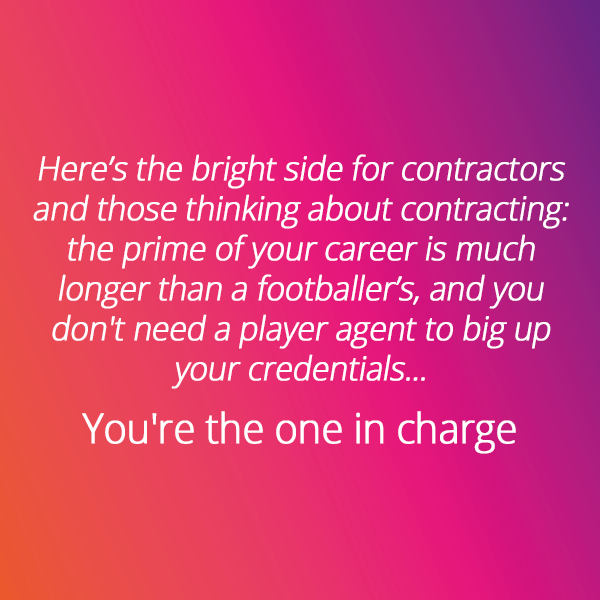 Today, as a contractor, the IT consultant – just like the goalkeeper coming back from an injury – has a self-determinism in their career unseen heretofore. In a way, looking out for yourself and your prospects is its own form of sport, but with a longer career span and a series of ways to fulfil your potential in an economy starving for what you can bring to the table. Good luck getting odds down at the betting parlour on where you’ll end up next, though.